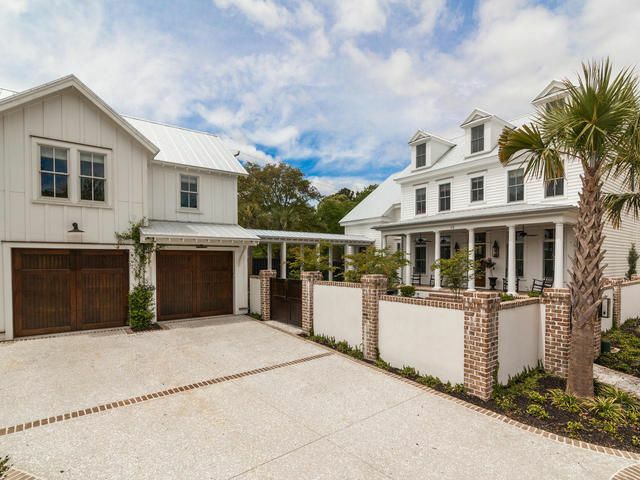 Exquisite MARSHFRONT home in the sought after Ion neighborhood,on coveted Duany Rd. From the moment you enter this home designed by Neal Van Dalen you are surrounded with amazing architectural details, soaring ceilings, and details throughout. Huge kitchen with two story ceiling is the hub of this home with a 10 foot island anchoring the great room. With the abundance of oversized windows and transoms, natural light abounds yet because this home is tucked back on the marsh, it has privacy rarely found in Ion. Seven sets of French doors lead to outdoor porches overlooking the marsh. Everything you would expect in a luxury high end home and more. Marble throughout,7' wide plank white oak wood floors,sound system,central vacuum,security system w/cameras,extensive shiplap and trim throughout. Luxury awaits in the main floor master with soaring vaulted ceiling overlooking the marsh with its own private screened porch. Victoria Albert soaking tub and huge glass and marble shower await. Upstairs are multiple oversized bedrooms with walk in closets. The fifth bedroom designed by the architect to be a "coastal bunkbed suite" is currently set up as a theatre room. Amazing "Tower Room" with wall to wall windows overlooking the marsh currently being used as an office, but could be used as a great drafting/art room, game room or quiet den. Second floor also has a finished storage room. Third floor is finished as open recreation room with built in craft desk and lots of storage. The detached carriage house features a one bedroom apartment complete with full kitchen, bathroom and walk in closet. The carriage house has the same high end fit and finish as the main house with board and battan walls, 5 inch white oak flooring, custom cabinets, stainless steel appliances and marble throughout the bathroom. Rented in the past for $1450/month. Enjoy the private elegant Charleston garden courtyard, custom designed by DIG landscaping, complete with tiered fountain, outdoor shower, beautiful landscape and brick lined walkways. Room for a pool, if so desired. This home was thoughtfully designed to take advantage of the marsh views from every room possible and it shows. Option to join Ion Club for pool, tennis, and exercise facilities.